Top View - Image magnified 360 Video - Image magnified for a more detailed view. Help us improve, rate our 360 view. How useful is our 360° view? Your feedback is instrumental to help us improve our 360° interaction. Order now and your package will ship on Friday, April 19. The bracelet you've selected is exceptional and deserves special attention. Please phone a diamond and jewellery expert and they will help you complete your order. The selected chain length is temporarily unavailable. Please call 1-888-565-7609 for further assistance. 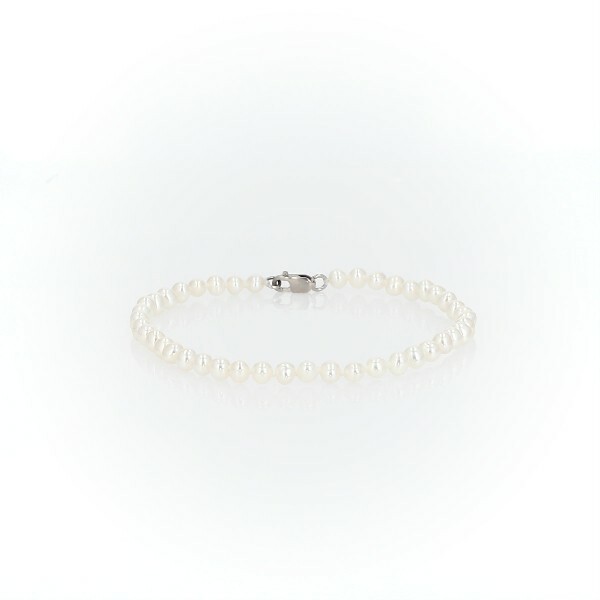 Classically luminous, this Freshwater cultured pearl bracelet features nearly-round white pearls strung on a hand-knotted silk blend cord. A polished 14k white gold safety clasp secures the look. Our Freshwater cultured pearl bracelets are available in a variety of lengths and pearl diameters. The item you've selected is exceptional and deserves special attention. Please phone a diamond and jewellery expert and they will help you complete your order. If you don't see your chain length, please call 1-888-565-7609. We may still be able to help you. Note: Prices and availability are subject to change without notice. View our terms and conditions for more information. Some limitations may apply to free returns. See our Return Policy for details. Get Exclusive Offers and News Enter a valid email address. Processing error, please try again. Thanks, you're on the list. All prices are in Canadian dollars.